Dau Go Cave is one of the most beautiful cave at Ha Long. 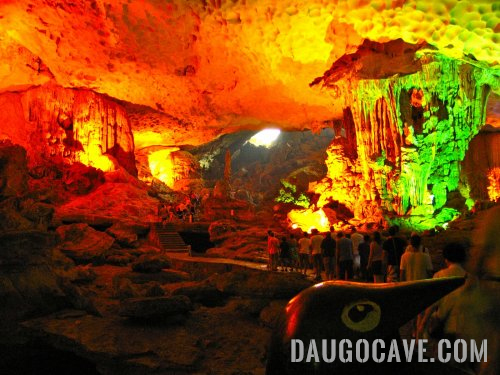 The name, Dau Go Cave or Giau Go, has direct ties to the history of Vietnam. According to the locals, while preparing for the Mongolian attacks in 1288, general Tran Hung Dao, sent a convoy to this area to cut wood from this region. Wooden stakes were then fashioned from the wood and hidden in Dau Go cave. The stakes were embedded in Bach Dang river to form a barrier against the attacking Mongols. According to legend, general Tran Hung Dao dealt a great blow to the Kublai Khan when he tricked the Mongolian army into chasing him deep up Bach Dang’s channel. When the tide were down the enemies were stuck in these wooden stakes driven into the river bed. Dau Go cave was also the site where general Tran Khan Du hid his force while waiting for the Mongols led by Truong Van Ho in 1287. Dau Go Cave is located on a limestone islet 8 km south of Bai Chay. The islet itself stands 187 m above sea level. Upon arriving visitors must hike the 90 rocky steps that lead to the cave’s entrance. There are three chambers with the outer one having the most spectacular stalagmites and stalactites. Some are as tall as 20 m in height. The locals claim that these giant formations resemble human forms and are the keepers or guardians of Dau Go cave. The outer chamber is also the largest with capacity for three to four thousand people. Dau Go cave’s floor is approximately 6 m lower than the entrance and the distance from floor to ceiling is approximately 25 m.
Dau Go Cave is probably the most famous of all grottoes in Ha Long. Since its discovery, many Vietnamese dignitaries have visited Dau Go cave. In 1929, King Khai Dinh (Nguyen dynasty) visited Dau Go cave and was awed by its beauty. His praise in writing is carved on a stone stele at the entrance of the cave.